Researchers at the University of Maryland dental school have developed cavity-filling composites based on nanotechnology that kill bacteria and regenerate the tooth structure. The university has filed patents and is seeking licensees to commercialize the technology. 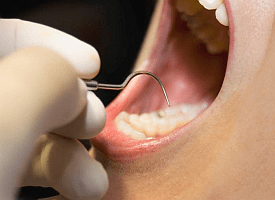 The work of Maryland dental school professor Huakun (Hockin) Xu aims to improve on the standard dental fillings that limit the damage of tooth cavities from decay. After a dentist drills out a decayed tooth today, Xu notes, the cavity still contains residual bacteria, thus the importance of neutralizing the harmful effects of the bacteria that remain. Xu and colleagues developed a new composite material for filling cavities with an antibacterial primer and antibacterial adhesive. The material includes calcium phosphate nanoparticles that regenerate tooth minerals. The composite also has an antibacterial component with a base of quaternary ammonium and silver nanoparticles along with a high alkaline pH to limit acid production by tooth bacteria. The University of Maryland has patents pending on the nanocomposite and the primer and adhesive technologies, according to the university’s technology transfer office, with licensing opportunities available. The new products have been tested in the lab on biofilms from saliva of volunteers. The Maryland team is planning to next test its products in animal teeth and in human volunteers in collaboration with the Federal University of Ceara in Brazil.